Featuring a 5.5" PDW barrel, the MCX platform has never been more compact or accessible. Ready to go where-ever it's needed, the MCX Rattler has a thin, foldable stock for easy concealment and stowage. This gun was designed from the ground up to be as discrete as possible while retaining all the capabilities of the MCX. 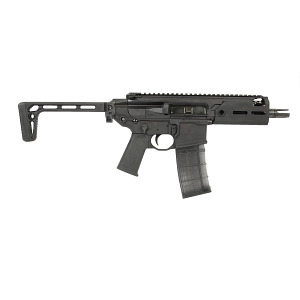 Free-floating M-LOK handguards matched with a PDW upper and a PDW Ultra Thin Folding Aluminum Stock, the MCX Rattler SBR is the ideal choice for fast-moving operators.